There was a great series of strips in Garry Trudeau’s Doonesbury where journalist Rick Redfern was assigned a series of columns about being a hands-on father. He and his wife, legislative counsel Joanie Caucus, have a young child, and Rick has stayed at home with little Jeff in the interest of journalism. Rick ends up spending more time writing about parenting than actually parenting, and at the week’s end, Joanie delivers an apt and scathing observation that, if a woman tried to write a newspaper series about being a hands-on parent, it would be banal, but if a man changes a diaper, it’s worthy of column inches. Those strips came to mind as I was reading Yumi Unita’s Bunny Drop (Yen Press), though not because it reaffirms Joanie’s argument. It may be about a man accepting the responsibilities of fatherhood, but Unita refrains from any grandiose proclamations on her protagonist’s virtue or courage. He’s learning to be an adult, which is ideally the most normal thing in the world. Daikichi is 30. He attends his grandfather’s funeral and learns that the old man left behind a six-year-old daughter. Daikichi is shocked by his relatives’ attempts to dodge responsibility for the withdrawn little girl, and he impulsively offers to care for Rin. Under another creator, this might be fodder for wacky domestic comedy, with the bachelor dad screwing up in ostensibly hilarious ways. (The back-cover text tries to imply that this is the case. Only one sentence ends with a humble period, with the rest sporting exclamation and question marks.) Unita’s approach is in a much lower key, and I think the results are distinctly satisfying. 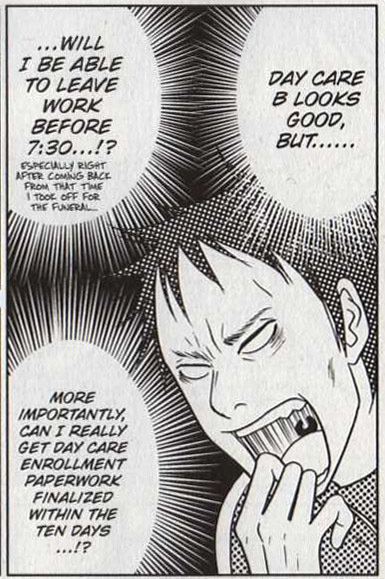 Daikichi is neither a natural parent nor a disastrous one. He has good intentions and no experience, so he does what any sensible person would do. He asks friends and relatives for advice when he encounters an issue that’s beyond his ken. He does research on the web to find expert opinions. He makes changes to his life that are in both his and Rin’s best interests, like picking the right day care center for Rin or adjusting his work responsibilities so he can spend more time with her. If it sounds a little banal, it is, but it’s banal in a very rewarding way. But Bunny Drop isn’t a documentary, and Unita is skilled at finding the humor in her characters’ situation without overdoing it. Daikichi may be a functioning adult, but he is immature in some ways. He’s awkward around women and isn’t naturally fond of children, so his relationship with Rin can seem like that of bickering siblings rather than guardian-child. 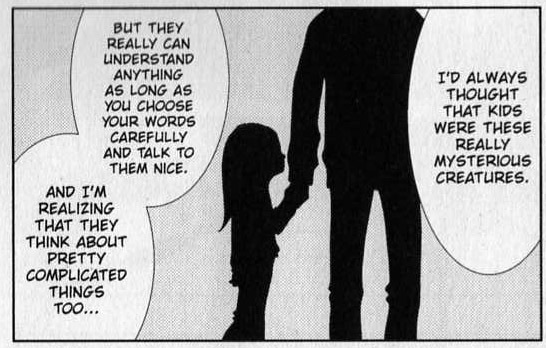 And Rin is a very believable kid. As she shakes off her reserve, she does some spot-on kid things. I loved her indignation at Daikichi’s mistaken identification of a beloved cartoon rabbit as a dog. The goofy bits make it all the more satisfying when Daikichi steps up as a guardian and Rin thaws a bit in response to his efforts. Unita’s art is unglamorous in just the right way. It fits the slice-of-life style of the story. Daikichi is supposed to be kind of ugly, and he is, in fact, kind of ugly. Rin’s body language is telling. When other characters discuss her mood, you can see it on the page in her facial expressions and posture. Settings are sufficiently detailed to create those familiar landscapes – home, work, school, the train. The pages don’t exactly dazzle, but they serve the story’s style very well. 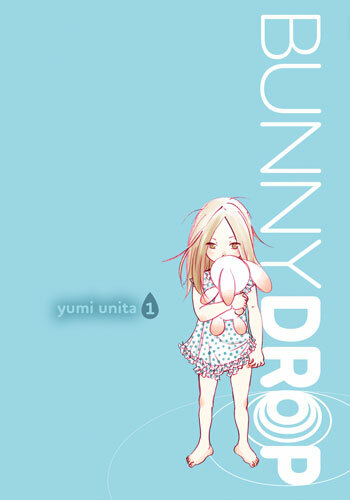 I hope Bunny Drop enjoys commercial success for a few reasons beyond the fact that it’s intriguing and well-crafted. It’s in the still-risky josei category for adult women, originally serialized in Shodensha’s Feel Young. (It’s rated for teens, though, so that shouldn’t be a sales barrier.) It also presents a desirable, alternative fantasy object in Daikichi. He’s not some controlling, infallible prince type. He acknowledges his shortcomings, he listens to people, and he’s open with his feelings, but he’s not so drearily sensitive that you start inching towards the bar. You are currently browsing the The Manga Curmudgeon blog archives for the day Monday, March 15th, 2010.